Why does a "Golden age of gas" come to China, and maybe Turkey is already on the verge of it, while Europe could be prepared for an elusive "Age of Shale"? China has long stopped surprising us with their high rates of economic growth and unique projects. Although there are more and more talks about slowing down the development of this country, new projects continue to be created that each time makes us move further away the limits of our imagination. For example, such a project is like the largest in the world fan-shaped solar-powered office building located in the Shandong Province in northwest China. This building set a new world record for the usable area covered by solar panels, a total area of which amounts for 75 thousand square meter. Chinese natural gas market also deserves much of our attention, especially with regard to growing environmental requirements. Air quality problems give an impulse to the Chinese government to take tough measures for reducing environmental pollution. In this regard, the use of natural gas, especially as a replacement of coal, becomes one of the main directions for reducing emissions. It is stated in the 2014 Medium-Term Gas Market Report of the International Energy Agency (hereinafter - IEA) that the development of energy, industrial and transport sectors of the Chinese economy stimulates demand for gas which will increase over five years by 90% and in 2019 will amount to 315 bcm. The national gas resources will meet a half of the demand since projected natural gas production in China will grow by 65 per cent from 117 bcm in 2013 to 193 bcm in 2019. In the meantime, it is expected that China will continue to act as a major importer in the world gas market. Here it is very appropriate to repeat a summarizing conclusion of the IEA five-year forecast, published on 10 June of this year: " 'Golden Age' of gas coming to China". In fact, it is unlikely possible for us to consider the EIA experts' conclusion as something extraordinary. That is rather a matter of the recognition of obvious facts. A the same time there is another statement in this IEA market report which should be regarded already as a signal to Europe that expected changes in the global gas market will pose significant challenges for the European energy security. In particular, it is quoted as saying that "near-doubling of Chinese demand for gas by 2019 offsets slowdown in other regions (of the world – ed.)". Let us to clarify that it will happen primarily because of the reduction in gas supplies to European market! Consequently, gas intended now for "European" imports after a while will become gas for "Chinese" imports... In such a manner, probably, we shall be told soon about LNG redirected to Chine from Qatar, Peru, etc. What is more important, it can obviously concern the gas imports by pipelines from Russia! Apparently, our policy makers in Brussels both in the former and in the new structure of the European Commission in addition to all the other duties indirectly are turning into reality the above-mentioned forecast of the Chinese gas market development. In Europe, all of us know their statements about the aims of diversification of gas supplies to the EU and strengthening the security of gas supplies by means of reducing the share of Russia in the European gas market. There is a famous old saying: "Be careful what you wish for, it might come true". Have our policy makers in Brussels and other capitals really expected that their wishes would be executed by Russia to that extent? What kind of reaction from Russia did they expect to receive in response to the repeated statements of their intention of limiting the share of Russian gas imports and, particularly, in response to the decisions of the European Commission aimed at countering the construction of gas pipeline "South Stream"? Unfortunately, getting deeper and deeper into a gas confrontation with Russia, Europe mostly confine itself to vague generalities and assessments of the stress tests before the upcoming winter. Our old and therefore wiser Europe, unfortunately, showed no foresight. After all, the majority in Europe hardly expected to obtain such an extensive and definite response of Russia. At first, the Russian counter-response became the new Russian-Chinese gas agreement, which provides for supplies of gas to China via a so-called "Western route". It is especially important for Europe, that gas for Western route to China will be produced at the same gas deposits in Western Siberia, which are used to ensure supplies to our market. Thus, while there is an political discussion in Brussels how to carry out a diversification of gas suppliers, Russia is already performing in practice a diversification of its export markets. Although the tone of the EU policy makers began to soften and there have been recently some statements mentioning the gas pipeline "South Stream" as an important project for Europe. However, it was too late and not enough - so now Russians shut down the project "South Stream" themselves! Not for the first time, as they might say, unwittingly, Brussels and Washington efforts to restrain Russia in the energy market have played a catalytic role in its transition to a new, higher level of diversification of export markets for Russian gas. 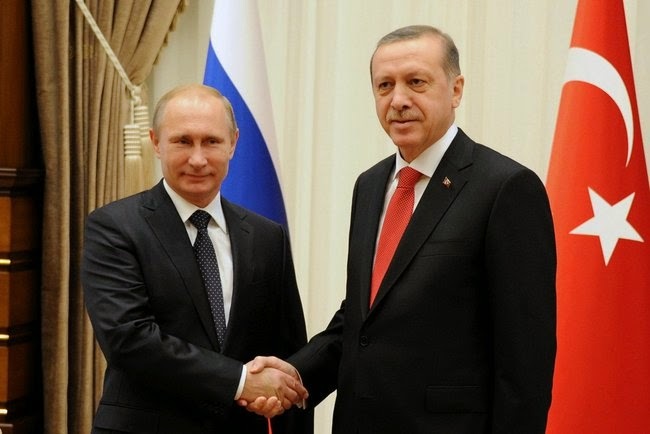 New, but maturing for some time breakthrough in relations with Russia in gas sphere was achieved in the talks of President Vladimir Putin in Turkey where he stated that for Russia under the present conditions it is impossible to continue implementation of the "South Stream" project because of the non-constructive position of the European Union. In turn, as a result of these negotiations, Russian supplies would increase by 3 bcm through the pipeline "Blue Stream" and Turkey would receive a 6 per cent price cut on Russian gas from January 1. Ultimately, Turkey has taken an important step toward becoming the gas hub on the southern border of Europe. Moreover, this is a considerable contribution into the opening of the "golden age of gas" at the Anatolian peninsula. Meanwhile current developments in the European gas policy reveal even for non-experts that further attempts of the dialogue with Russia from a position of monopoly buyer of its gas do not make sense. It is obvious that packages of sanctions and other types of EU pressure on Russia have given unique results. Nevertheless, to our disappointment they are opposite to those on which many Europeans would like to count. It raises disappointment of Bulgarians that their country lost a historical chance of being a big player at European energy market should not it? It happened also much to the annoyance of other countries of South East and Central Europe, which in vain have been preparing for the implementation of the pipeline "South Stream" for a number of years. Now Europe is suffering from a shortsighted policy in energy sphere and is looking constantly backwards on the transatlantic partners, who promise an elusive "Age of Shale" setting back hopes for a "Golden Age" at the European market of natural gas. The impression is as if somebody else decides for Europeans that there will be no new demand growth in gas in Europe, and that Europe should live out its remaining time only with thoughts about the Golden Past. Indeed, according to Eurostat in 2013 gas consumption in 28 EU member states decreased by 0.4% in comparison with 2012. Why under these circumstances do the political ambitions of some of our state leaders not give way to economic feasibility, as well as to citizens' desire for stabilizing relations with Russia strained below any reasonable limits, especially in the gas sphere? Why would not do it, and thereby actually drive Europe's economy forward particularly in the less-developed European countries to the sustainable growth?